Sen. Cory Gardner (R-Colo.) is threatening this morning to start holding up the confirmation process for White House Justice Department nominees unless Attorney General Jeff Sessions reverses a decision to roll back a policy allowing legalized recreational use of marijuana in some states. 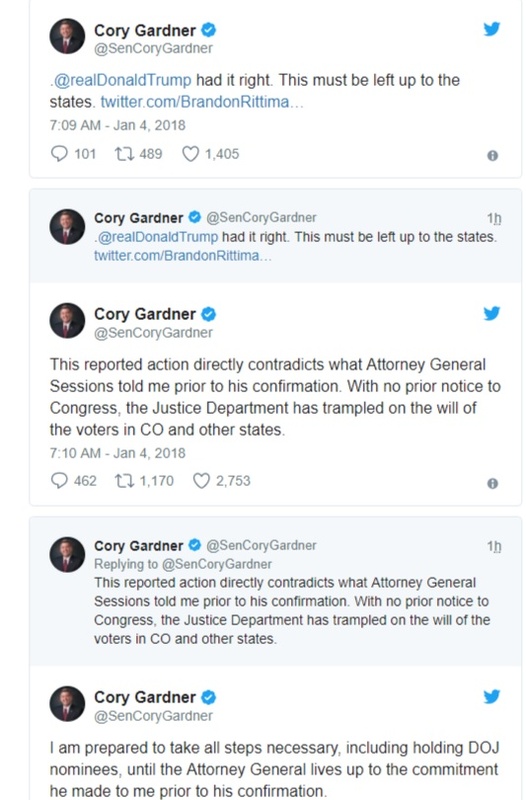 Gardner said in a series of tweets that Sessions had told him before he was confirmed by the Senate that he would not change an Obama-era policy that discouraged federal prosecutors from pursuing marijuana-related offenses in states where the substance had been legalized. Colorado is one of those states. The GOP needs to get it's sh*t together. They are a mess right now.